It appears that Airtel, one of the popular Internet service providers (ISP) in India, has started blocking several file sharing websites such as Rapidshare, Sendspace and MediaFire. First reported in the India Broadband Forum, this move seems to be driven by the rampant piracy of media files on these websites. Airtel hasn’t officially confirmed whether these websites have been banned at its own will or it has been ordered by the Department of Telecommunication (DoT) to do so, although a screenshot from Sunny Chahal, one of Airtel Broadband’s users points at the latter. Confirming this ban, one of the users of India Broadband Forum who goes by the name “naveen_reloaded” ran Traceroute commands on the connection to these file sharing sites and found that the requests went through flagtel servers in all cases, indicating that Flagtel has something to do with this ban. We tried accessing these websites on BSNL Broadband and they seem to be working just fine for us at the time of writing and if DoT has reportedly ordered the ban on these file sharing websites, as claimed by Airtel, it should essentially apply to all Indian ISPs. It must be noted that there are some conflicting reports in the thread mentioned above, where a few users from other ISPs such as BSNL, MTNL and Reliance broadband are reportedly facing the same ban. 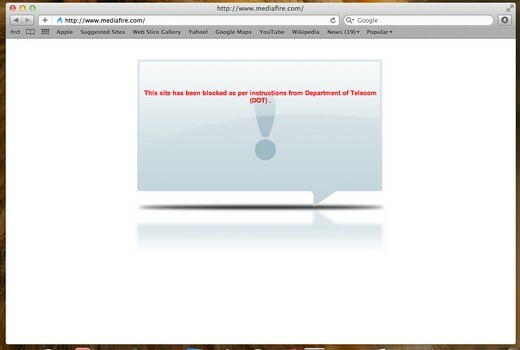 That aside, this is not the first time that India has faced Internet censorship from ISPs with several Indian ISPs recently blocking Typepad.com, Mobango.com and Clickatell.com without warning in March this year, claiming that it was ordered by DoT to do so, while the latter revealed in an RTI request filed by Medianama that it hadn’t ordered ISPs to block the sites in question. Update: Airtel has just tweeted that it has removed the ban and all users can now access the above mentioned file-sharing websites, exactly as they could before. Although Airtel didn’t specify the reason for the ban, Medianama reports that this ban was due to a court order from BIG Pictures, a subsidiary of Reliance Entertainment. According to this order, BIG Pictures can issue cease and desist notices on all pirates copying and distributing its latest film, Singham, which will be released in local cinemas tomorrow.